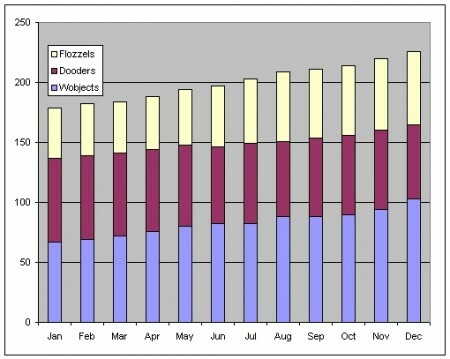 It’s time to lie with charts! 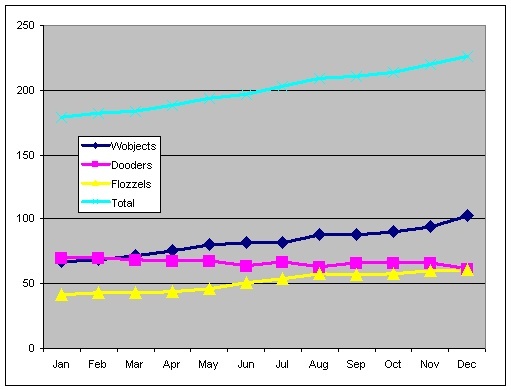 A few months ago I posted a FriendFeed item about how deceptions of scale can be used to make misleading charts. Earlier this month, Wired argued in an article that “the web is dead” and tried to prove their point with a rather curious chart: A stacked area chart with the changing percentage of the Web’s share of total Internet traffic between 1990 and 2010. Peer-to-peer and video take up a large share of total traffic in 2010 — naturally, because these files are huge, and web pages are relatively modest in size. A more honest chart would look at total volume of use (eyeballs/visits). If you read a tweet on twitter.com and then watch a video on Netflix, it’s not at all fair to assume the video was 3,571,429 times more important to you than the tweet. But even setting aside the stupidity of conflating the importance of contents with its file size, a stacked percentage area chart is a visual deception. There are many ways to lie with charts, and stacking is one of the most frequent. Here’s a simple example. Suppose your company sells three products, Wobjects, Dooders, and Flozzels. You have sales data for a year. 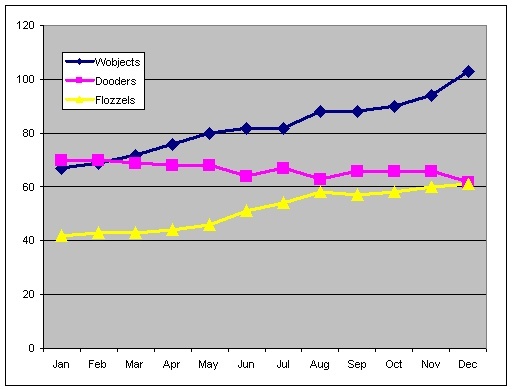 It turns out that Wobjects are growing fast, and Flozzels are selling pretty well, but Dooders are sucking wind with sales volume decreasing. 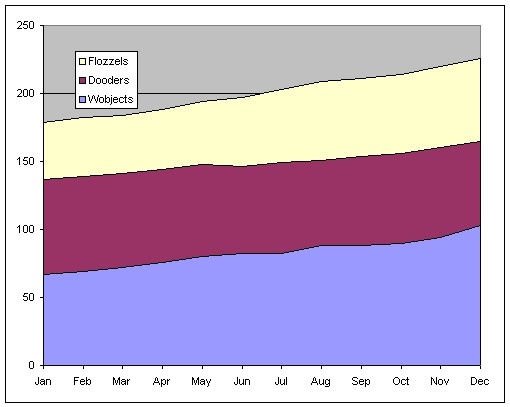 If you want to hide how poorly Dooders are doing, just use a stacked chart. 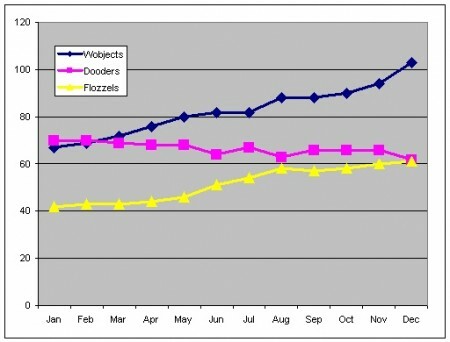 Certainly if you know what you’re looking for you can eyeball the decrease in sales from Dooders. But for most people only the overall growth would jump out. This is slightly less deceptive because the eye is slightly better able to see that the middle area is decreasing in size over time. A line chart is not very deceptive for individual trends. Including the total makes the scale larger, hiding the amount of increase/decrease for individual series, but is valid if the overall total is the most important detail to convey. 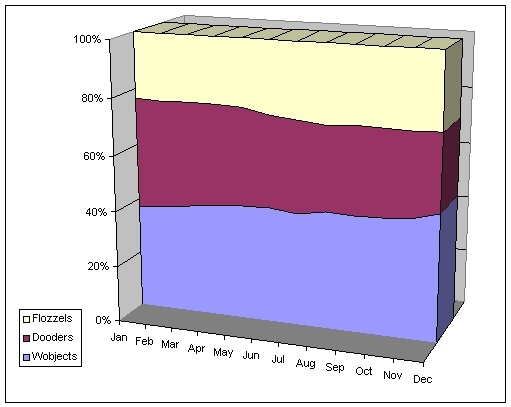 The most honest approach for showing the performance of individual product lines is a straightforward line chart. Stacked percentage charts are usually disastrous, because the relative share of three product lines is often totally irrelevant compared to the actual change in value. And 3-D is just a distortion. This entry was posted by Stephen on Tuesday, August 31st, 2010 at 2:20 am	and is filed under business, skepticism. You can follow any responses to this entry through the RSS 2.0 feed. You can leave a response, or trackback from your own site. With skills that are this impressive you should be working at an investment bank instead of a tech outfit.